Free-flowing rivers are the freshwater equivalent of wilderness areas. They provide crucial habitat for a host of animals, and support the survival of both people and nature around the world. What is a free-flowing river? A free-flowing river is largely unaffected by human-made changes to its flow and connectivity. Water, silt, and other natural materials can move along unobstructed. Animals, such as river dolphins and migratory fish, can swim up and down stream at will. And the river itself can swell and shrink naturally, flow at an organic volume and rate, and replenish groundwater sources. Where are the world’s free-flowing rivers? 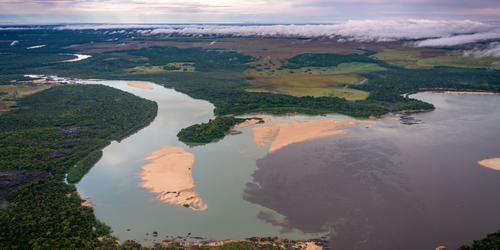 Most of the world’s longest rivers have been dammed or otherwise altered. Most long, free-flowing rivers remain only in remote areas that are difficult to be exploited economically (e.g. Arctic), in less developed regions (e.g. Congo), or in places where political conditions make it difficult to build hydropower (e.g. Myanmar). Why are free-flowing rivers important? Click on the numbers in the illustration to learn more. Connected rivers support sediment transfer to healthy floodplains, which help reduce risks from floods and droughts and provide critical habitats and food sources for animal and plant life. Sediment can also be carried all the way downstream to deltas, which is particularly important as sea levels rise. In places around the world, free-flowing rivers hold cultural and spiritual importance. Pristine scenery and natural flows often offer recreational and business opportunities, including rafting, fly-fishing and wildlife watching. Rivers with high connectivity are among the most ecologically important freshwater habitats, places where vulnerable species can thrive and adapt to climate change. Tens of millions of people depend on freshwater fish populations, many of which require certain natural conditions, such as seasonal flows and temperature changes, in order to breed and thrive. Sediment helps build up and maintain deltas. Without it, deltas will succumb to rising sea levels. 6. Natural river flows recharge vast networks of underground water, which are increasingly strained by growing human demands. What prevents a river from flowing freely? Infrastructure is the biggest culprit in interfering with the flow of a river. The wrong dam in the wrong place changes how a river flows and causes blockages. Animals that migrate to find food, reproduce, or seek new habitat as the seasons change—such as salmon and river dolphins—can no longer do so. This threatens important animal populations and people who depend on freshwater fish for survival. A road or city built alongside a river in its floodplains can prevent the river from naturally growing and shrinking throughout the year, particularly when development is protected by a big flood wall. Natural aquifers—underground layers of rock, sand, or grave that store water—are an important source of water for drinking, agriculture, industry, and municipalities. They absorb water from rivers and supplement supply during dry periods. When aquifers are disconnected from rivers, they are not replenished. We are losing our free-flowing rivers. Initial research revealed only a third of the world’s 177 longest rivers—621 miles (1,000 km) or longer—remain free-flowing, unimpeded by dams or other barriers. Together with partners, WWF is now publishing a comprehensive, science-based report on the state of the world’s free-flowing rivers. Learn more about free-flowing rivers with our augmented reality app WWF Free Rivers. WWF needs your voice in protecting the world’s free-flowing rivers. Throughout 2018, we’ll be featuring a variety of actions you can take to stop the construction of bad dams, protect freshwater wildlife, safeguard communities that rely on healthy rivers, and more. Help secure a future for freshwater.